New report shows Colorado's share of "unauthorized immigrants" is slightly higher than the national average - Denverite, the Denver site! Unauthorized immigrants accounted for 3.7 percent of Colorado’s population in 2014, according to Pew Research Center. Nov. 04, 2016, 5:46 p.m.
An estimated 200,000 immigrants were living in Colorado without legal permission during 2014, according to a Pew Research Center study released Thursday. The so-called unauthorized immigrants accounted for 3.8 percent of Colorado’s population in 2014 — not a significant change from the last survey in 2009. That’s slightly higher than the national average of 3.5 percent. 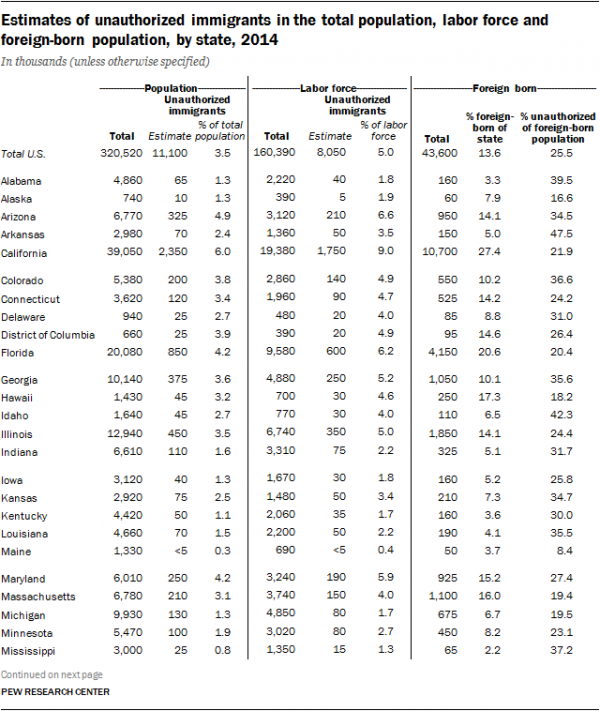 Nevada had the highest percentage of unauthorized immigrants at 7.2 percent of the population. California had nearly 12 times the number of unauthorized immigrants as Colorado — and the most in the nation — with 2.4 million people. Most of the immigrants living illegally in Colorado (72 percent) are from Mexico, according to Pew. Under federal law, it’s generally illegal to employ an unauthorized worker. Despite that, unauthorized workers made up about 4.9 percent of the workforce in Colorado in 2014. Most of those people were employed in construction, agriculture and leisure and hospitality jobs, according to Pew. Hiring workers illegally may allow some employers to avoid paying state-mandated minimum wage. Pew finds another reason for employing unauthorized workers is that they’re younger than the population as a whole and are more likely to be of working age than other groups.